Dr. Fred Monempour is a Southern California local, who grew up in Los Angeles. 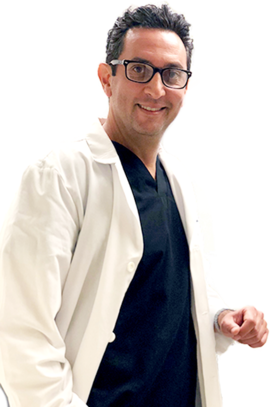 After he completed his Undergraduate studies at UCLA, Dr. Monempour received his dental training at USC, where he also continued to obtain his Residency in Microsurgical Endodontics. He has been practicing in Beverly Hills since the year 2000. ‍‍‍Dr. Monempour prides himself in challenging cases, as retreating and fixing damaged root canals. His number one goal is to preserve teeth rather than extracting and placing implants.While many dentists perform multiple procedures, Dr. Monempour focuses particularly on his specialty of endodontics to give his patients maximum results in what he does best. Dr. Monempour performs the whole procedure under a microscope, which improves the quality of the treatment allowing him to see and clean the infection much better evidently leaving a more promising outcome. Dr. Monempour has lectured both nationally and internationally on various topics. He is a part time faculty at USC School of Dentistry. He pioneered the use of CT technology in endodontics, which is instrumental in determining how best to treat patients, who have complex and difficult problem areas. Often time’s patients have seen multiple specialists in order to localize the pain, unfortunately leaving the condition unchanged. Dr. Monempour’s skilled and profound knowledge has always leaded him to successfully identify the pain and eliminate it, leaving him the sole specialist any patient needs. On his free time Dr. Monempour enjoys spending time with his wife and three children, who inspire and complete him to live a prosperous life every day. He balances his busy life with an active lifestyle, including getaways and sports. Tennis and skiing are among his favorite outdoor activities.The thrill of challenges, competitions and team work motivate Dr. Monempour to always strive to be his best in anything and everything he does. Dr. Monempour is partners with Dr. Sharon Sabet, who is not only a provider for certain insurances, but also works in collaboration with Dr. Monempour during difficult cases. Dr. Sharon Sabet received both her Undergraduate studies and dental training at UCLA. In 2007, she completed her Residency in Microsurgical Endodontics in Philadelphia. We offer same day service, so patients experiencing any discomfort can be seen immediately. We provide different forms of pain medications to assure a pleasant and painless procedure. We often use intravenous pain medications to help put patients to sleep. This aids patients, who suffer from severe anxiety in the Dentist Chair. We can also administer medications to help ease anxiety such as: Ativan, Valium, Halcion, and Nitrous Oxide. All these options provided can help create a pain free dental experience. © Copyright 2018 Fre‍‍‍d Monempour D.D.S.